If you were to believe this headline at the Independent (of a story cross posted from the Washington Post), you’d believe that CNN fired political commentator Marc Lamont Hill merely for criticising Israel and calling for a ‘free Palestine’. As we’ll soon explain, this isn’t even remotely accurate. However, even if you were to click the link and read the full article, you’d come away grossly misled. CNN fired Marc Lamont Hill on Thursday after the longtime contributor made comments about Israel during a United Nations speech. Hill, a media studies professor at Temple University, had drawn scrutiny for calling for a “free Palestine from the river to the sea.” The words drew criticism from some conservatives and staunch Israel advocates, who said such remarks echoed language used by Hamas and other groups that seek to eliminate Israel. The Guardian’s coverage was similar. Their Nov. 30th article (by Associated Press and Guardian staff), narrowly focused on Hill’s “river to the sea” comments, and quoted Hill’s denial that it was neither antisemitic nor or a call for Israel’s destruction. However, as Anti-Defamation League – and many others – observed, there is simply no question that, within the Palestinian community, and among Western pro-Palestinian activists, calling for a Palestine “from the river to the sea” represents an unambiguous rejection of the continued existence of a Jewish state. In fact, Hill himself, in a subsequent tweet, implicitly acknowledged his rejection of a Jewish state. Contrary to western mythology, black resistance to American apartheid did not come purely from Gandhi and nonviolence. Rather, slave revolts and self-defense and tactics otherwise divergent from Dr. King or Gandhi were equally important to preserving safety and attaining freedom. If we are in true solidarity, we must allow them the same range of opportunity and political possibility. We must recognize the right of an occupied people to defend themselves. To commit to political action, grass-roots action, local action, and international action that will give us what justice requires and that is a free Palestine from the river to the sea. These words can only be taken as the legitimisation of violence against Israelis. First, note how he evokes the “slave revolts” in America in the context of discussing the proper response to Israel’s treatment of Palestinians. This intellectually unserious analogy clearly serves as an attempt to place Palestinian terrorism against Israeli civilians – by Hamas and other armed groups – on the same moral level as the violent rebellion by some African-American during slavery. His support for violence is even more clear when he stresses that we shouldn’t “fetishize” peace, nor “shame” Palestinians for “resisting” Israeli “state violence”, and that “we must recognize the right of an occupied people to defend themselves”. So, even if we were to believe Hill’s claim that “from the river to the sea” is not taken from the Hamas playbook, as code for Israel’s demise, his support of ‘the right of resistance’ is an unambiguous defense of terrorism. Hill’s denial notwithstanding, he did in fact defend the killing of Jews – a fact that Indy and Guardian readers wouldn’t know due to editors’ decision to omit the most incriminating parts of the speech. Finally, it’s telling that Hill also denied, in response to CNN’s decision to fire him, that he has ever supported antisemitism. Yet, Hill has defended his friendship with Louis Farrakhan, who’s among the most extreme public purveyors of antisemitic rhetoric in the US. Farrakhan’s well-documented record of engaging in conspiratorial antisemitism goes back decades. Here’s a very short sample. In addition to his justification of violence, HIll’s speech (here) is full of gross distortions (claiming Israel routinely tortures Palestinian prisoners and that the IDF responds violently to “peaceful protests”), naked propaganda (he calls Israel a “settler colonial state”) and outright lies (he repeats the absurd charge that Israel is “ethnically cleansing” Palestinians, and erroneously claims Israel has 60 racist laws). 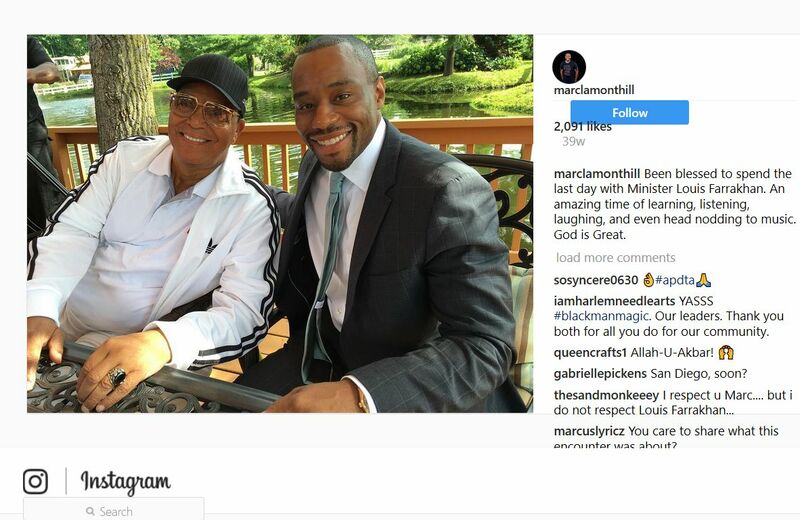 We can believe that CNN is conservative and staunchly pro-Israel, that Marc Lamont Hill was a ‘long time contributor’ and wrongly dismissed for gentle powder puff views, the Independent and Guardian are not at it again, or we can believe our lying eyes. The truth of the matter, of course, is that the Independent and the Guardian are treating this story with their same standard lying by omission technique on view since I became aware of British media coverage of the Israel story through this very website all those years ago. And look what a problem antisemitism has become in the UK body politic thanks to the ‘stewardship’ of such newspapers. Coincidence? I think not. It’s like they know what’s wrong with Hill’s hate speech so they edit it out as “problematic”. Whether that is deliberate or subconscious might be debatable but the effect is the same. https://vimeo.com/116675694 Marc Lamont Hill in Israel being and antisemite. WP is every bit as vile as the Guardian. It’s even worse than that: the Guardian routinely features some of the best journalism around, on a host of crucial topics, from politics to culture to the sciences — which only makes their inveterate unfairness and outright bigotry against the State of Israel all the more appalling.